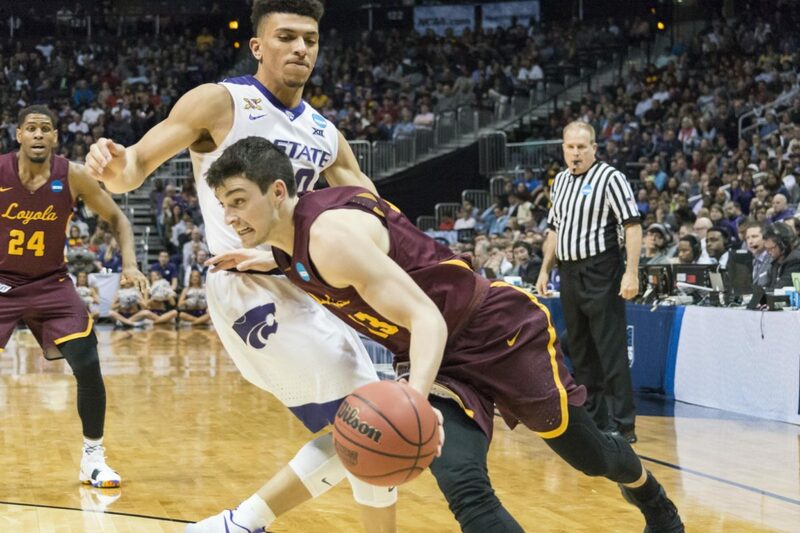 Hanako Maki | The Phoenix Redshirt senior guard Clayton Custer drives to the basket during Loyola's Elite Eight matchup against Kansas State. The Loyola men’s basketball team is scheduled play an exhibition game this fall, Loyola Athletics announced Monday afternoon. The Ramblers are slated to take on Division II school Winona State University Oct. 23 at Gentile Arena, according to a press release. Tipoff is set for 7 p.m.
Last year, Winona State — which is located in Winona, Minnesota — went 19-10 overall and 14-8 in Northern Sun Intercollegiate Conference play. The Warriors are coached by Todd Eisner, who played with Loyola head coach Porter Moser at Creighton from 1986-90. This is the second consecutive year Loyola has scheduled an exhibition matchup at Gentile. The Ramblers defeated another Division II school, Lewis University, 79-63 last year behind 20 points from then-senior forward Aundre Jackson. Loyola’s official home opener is set for Nov. 6 against University of Missouri, Kansas City — the Ramblers’ first regular-season game since their Final Four run last year.